What are the limits on religious satire? 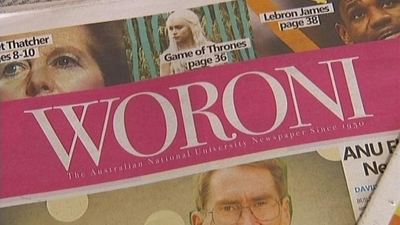 Recently, Woroni, the student newspaper of the Australian National University, was forced by the school to remove and apologize for a cartoon that satirized Islam. If the Woroni case were a routine matter of censorship, this story would be troubling enough, but looking beyond the censorship, this incident raises deeper questions about the application of censorship and the heavy-handed use of threats by the university against a student-run newspaper. According to Australia’s 7 News, on April 18, Woroni published their latest satirical installment of an ongoing series entitled “Advice from Religion.” The subject of this installment was Islam, and previous to this cartoon, “Advice” had tackled Judaism, Mormonism, Catholicism, and Scientology. Within two days, the cartoon was pulled from the newspaper’s website. Professor Young says he is not concerned by the comments, and denies the censorship is an attack on freedom of speech. He says the paper has published satirical pieces on other major religions without censure. But he says those pieces did not attract formal complaints. “They published a cartoon which was part of a satirical set of cartoons about religion but this one we felt overstepped the mark,” he said. What’s troubling about Mr. Young’s comments is that the rationale he uses to defend his actions in this singular instance could just as equally been applied to the other cartoons. He points to the other satirical cartoons as a sign that the ANU isn’t enforcing heavy-handed censorship, yet he then admits the reason Woroni was able to publish those cartoons was that they “did not attract formal complaints,” suggesting if they had, those cartoons would also have been pulled. The day following publication, the entire Woroni board was asked to attend a meeting with members of the ANU Chancelry, including Richard Baker, Pro Vice-Chancellor (Student Experience). The Chancelry wished to discuss the Woroni board’s response to a formal complaint submitted by the International Students Department. “This was most clearly demonstrated by the Jyllands-Posten cartoon controversy … and violent protests in Sydney on September 15 last year,” the Chancelry told Woroni. In light of these concerns, the Chancelry asked for an apology and an official public retraction of the piece. Woroni decided to respond in a similar manner to how it has to other complaints received in the past, by publishing an apology to any readers who felt victimised, while stressing that the piece was intended to be satirical. The Chancelry demanded a second, non-negotiable meeting with the Woroni board, and the three authors of the piece, attended by Marnie Hughes-Warrington, Deputy Vice-Chancellor (Academic). At this meeting, all Woroni editors and all three authors of the piece were threatened with disciplinary notice under Section 3.1(b) of the ANU Disciplinary Statue, should the PDF remain online. The consequences of academic misconduct under the disciplinary proceedings range between a warning letter to academic exclusion from the university. No legal representation is permitted at disciplinary hearings. The Chancelry also indicated that Woroni’s allocation of the Student Services and Amenities Fee (SSAF) may be compromised by the situation. The message sent by the ANU is that the students can run the newspaper so long as everything they print doesn’t cause headaches for the ANU. Nowhere does Vice Chancellor Young detail his specific complaints about the cartoon itself, instead falling back on the rationale that people were offended enough to issue a formal complaint and that they feared a violent reaction because the subject of the cartoon was Islam. The stance of the ANU suggests it’s okay to satirize Catholicism, Judaism, Mormonism, and Scientology because members of those faiths have a higher tolerance for being offended and won’t resort to violence when they are offended. By refusing to let the Woroni editorial board handle the matter in house, Vice Chancellor Young and the ANU board have both denied the students the critical experience of negotiating content that has offended a portion of their readership and revealed a clear blueprint for future censoring of Woroni.